I’ve been messing around with Record, Propellerhead’s latest software foray into the world of DAW’s. I could comment on the sheer visual complexity of the software, but I think that conversation has already occurred with Reason. With Propellerhead, it’s a matter of philosophy. For instance, let’s consider a single track of music. It contains the recorded audio, plus whatever effects you want to add. In a real-world studio (especially of the pre-digital era) a hardware effect like reverb was a box. A big, expensive box. Only an idiot would buy a separate box for each track in the mix – lunacy! Instead, engineers would be resourceful and bus everything through that effect and back. This is why mixers have sends and returns. But wait – what about now? With Logic, I’ll often say to myself “I should set up the bus for compressing the drums” but I don’t. I just copy the channel strip setting and go. One plugin for each track. On a high-powered computer, who cares right? It makes more visual sense to forget the baggage and see EXACTLY what is affecting a given track (feel free to disagree but I’m sure they invented copy channel strip settings for this specific reason). Record, Reason, and if you can remember, ReBirth have always thought about software as a bitmapped hardware screen. The mantra must be “make it look real” or something to that effect. Which is fine – they do a great job of mocking up fake real-looking devices. I’ve always felt their plugin design to be matchless. But Record isn’t a plugin, and I don’t wager most of the users will be running it as a plugs (as many Reason users I know do). Record is supposed to reinvent recording, and humanize the process, which brings me to my evaluation of Beta 6. 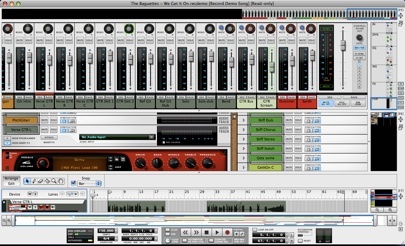 Almost every DAW is visually complex, but here’s an example of why I feel Propellerhead could streamline this a bit. In the above shot, the “Git Intro” track is showing three times. Not only does each have a mute/solo (this is common), but each is geared toward a different use. For instance, I can’t arm the recording from the mixer, nor can I pan from the track view (without adding an automation lane) This means to get the most bang from each window I have to break it apart into three separate screens. Four if you add Reason in. I like the idea of Record, but it’s pulling in two opposing directions, and I think it will hurt the marketing campaign a bit. Are a musician first and gearhead second – you want to cut the “BS” and record with a program written for the musician and not the engineer. A Reason buff that loves to tinker with lots of engineer-specific tools and settings. You probably love to hit that tab key and mess with the plugs too. See the problem? This is going to be in the same market as a very highly segmented family such as Logic/GarageBand or lightly segmented but popular mainstays as Pro Tools. That leaves…Reason people who use ReWire to send Reason stuff into another program. These people prefer Reason instruments, and Reason effects. Guess what? Propellerhead was nice enough to add those audio tracks you’ve been wanting so you don’t have to deal with Pro Tools! In closing, everyone should check Record out, if nothing else to convince yourself to buy a larger monitor. If you love Reason, you’ll love Record. If you feel indifferent to Reason, this will either cement your hatred for it or convince you to give it a second thought.